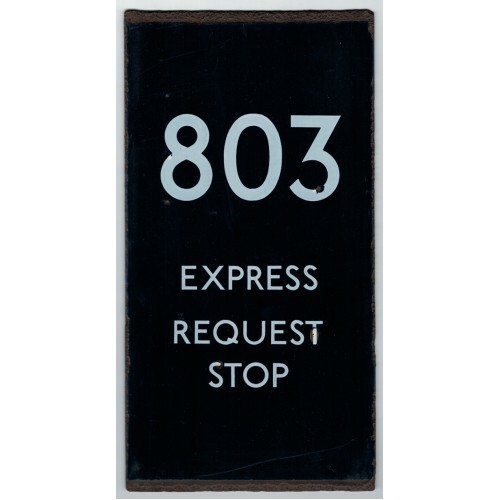 This auction is for an enamel London Transport Country Area Bus Stop double vertical e plate for Route 803 Express Request Stop. Route 803 was an Express Service running between Welwyn Garden City and Maple Cross via Hatfield, St. Albans, Garston, Watford, Croxley and Rickmansworth during Monday to Friday rush hours only. This double vertical plate will have come from one of the request stops along the route. It is extremely rare to find e plates with 'Request Stop' on them. It is in good condition but does have some edge chips and surface chips (see photo).